Mozilla's Firefox 12 browser made its official debut on Tuesday, featuring a nearly silent update process as one of its most important new features. “We put a lot of work into making the Firefox update experience easier,” explained the official announcement on the Mozilla Blog on Tuesday. From now on, “once a user gives explicit permission to Firefox on their first installation, they will not be prompted again for subsequent releases,” Mozilla says. 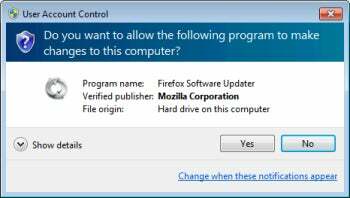 Firefox for Windows achieves this simplified process by removing the user account control dialog (UAC) pop-up that has traditionally required explicit user permission for each update. There's no adverse effect on system security, Mozilla said, but there is a great benefit in terms of fewer interruptions for users. "From a user perspective the repeated prompting is unnecessary because the first time that you accept the prompt you indicate that you put your trust in Firefox," Firefox Engineering Program Manager Lawrence Mandel explained in a blog post back in February. "After you have granted Firefox permission to update, it should continue to be able to update future versions of Firefox without prompting you again." We'll have to wait until the release of Firefox 13 in six weeks to test out how well the new process actually works, of course. Meanwhile, silent updates are currently scheduled to arrive for Linux and Mac users in Firefox 14. Google's competing Chrome browser has featured silent updating since its launch. Most of the other key additions in Firefox 12 affect primarily developers, thanks to 85 improvements to the browser's built-in developer tools. Developers no longer need to reload a page to see messages in the Web Console, for example, and there are new line commands for the Scratchpad editor. The full set of release notes is available from the Mozilla site, where you can also download Firefox 12 for free for Windows, Linux, or Mac OS X. If you're now running Firefox 11, the update will happen automatically.